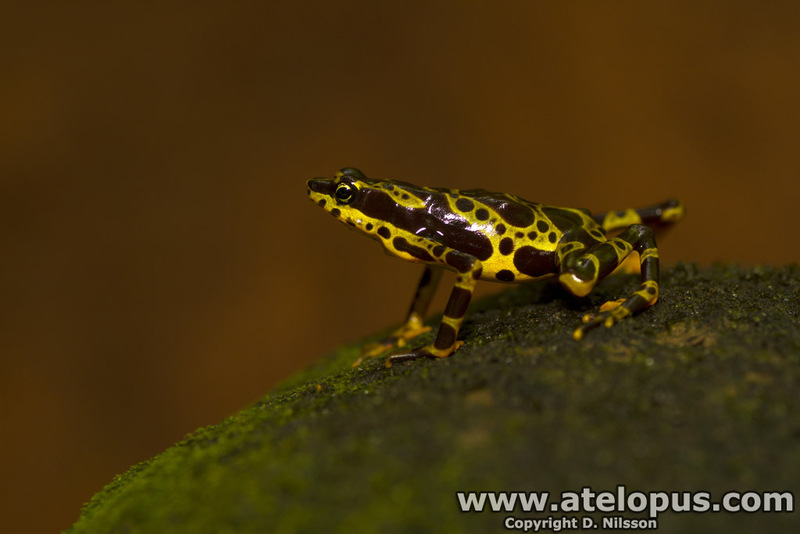 Atelopus spurrelli. 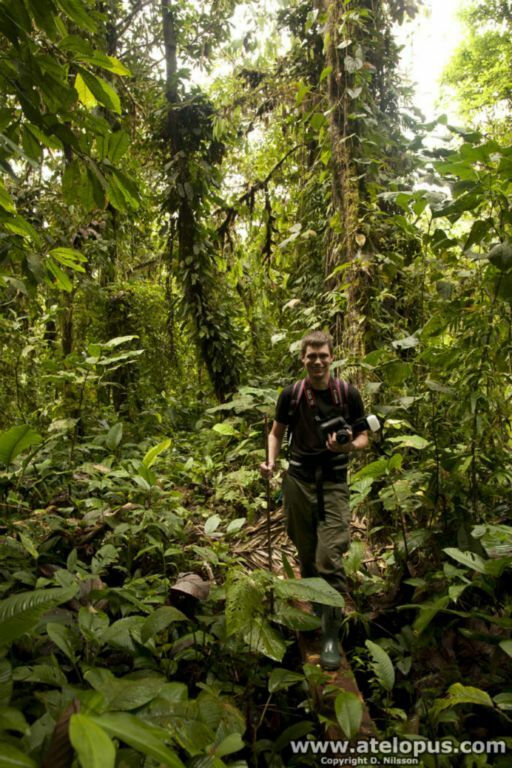 Population near Bahia Solano, Colombia. 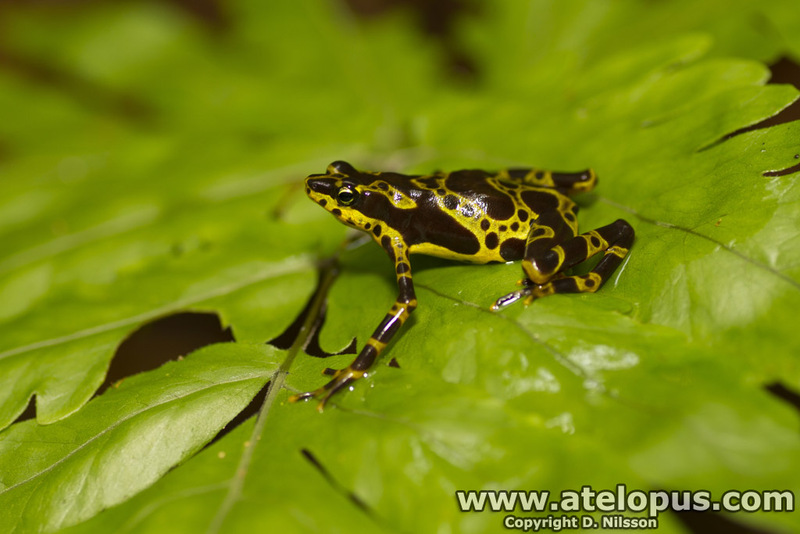 Atelopus spurrelli - male. 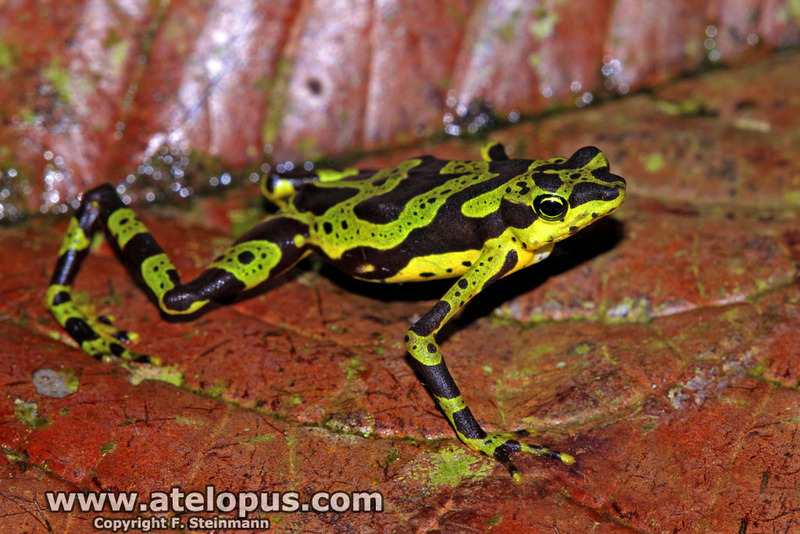 This individual was very green i coloration. 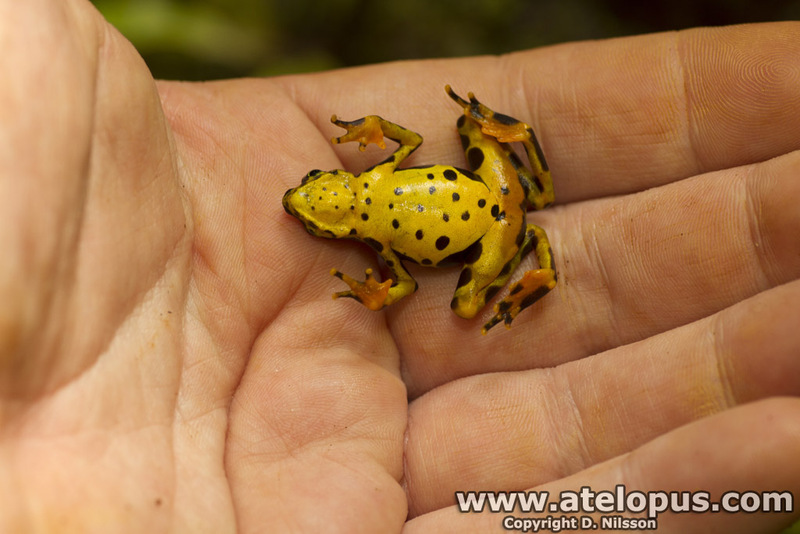 Atelopus spurrelli - notice the bright yellow ventral. 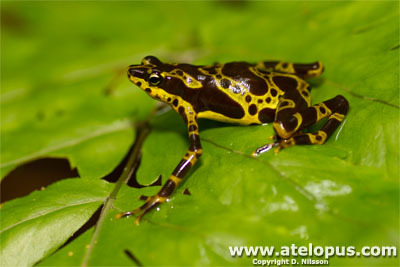 Atelopus spurrelli female. 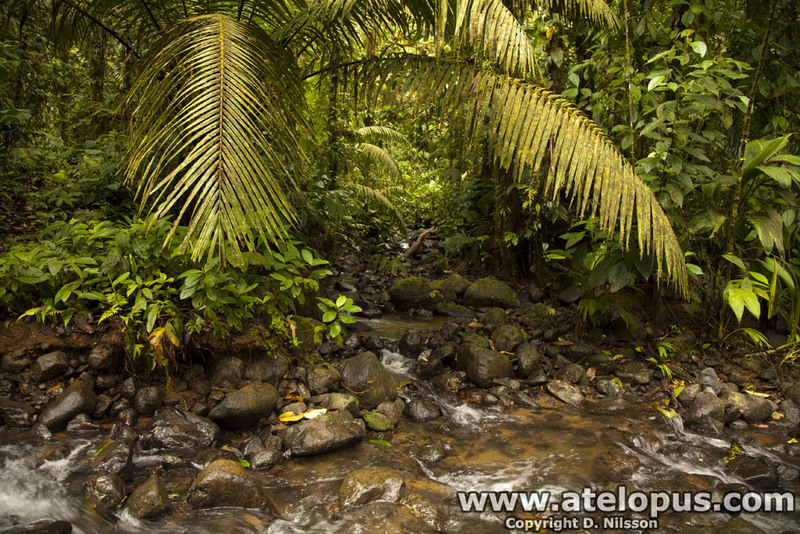 Population a couple of km from El Valle, Colombia. 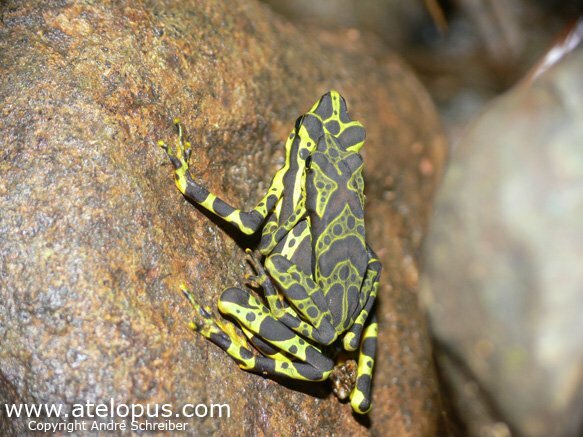 Native to Colombia. 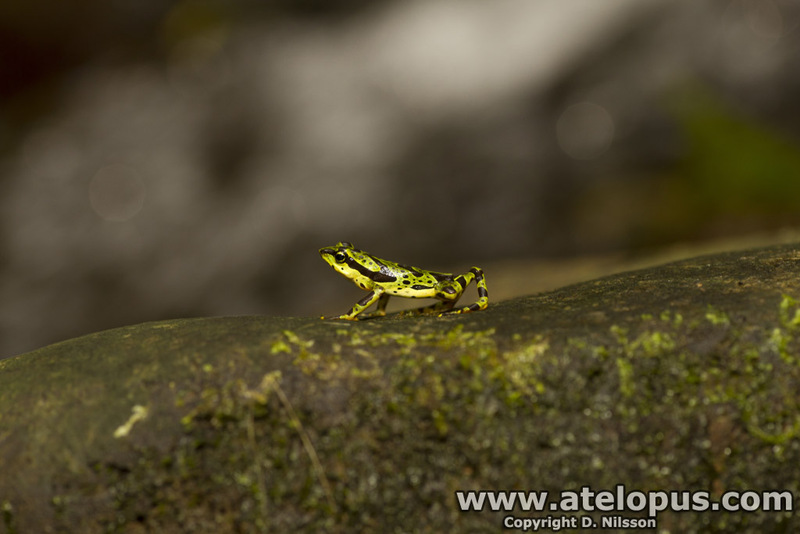 This species is endemic to the Colombian pacific lowlands in Valle de Cauca, Risaralda and Choco Departments. 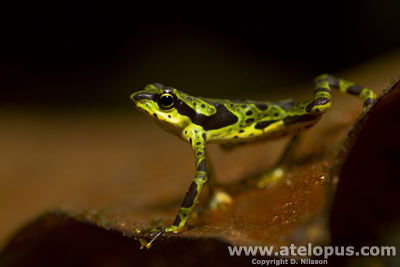 It is a low-altitude species, occurring at 50-500 meter above sea level (asl). 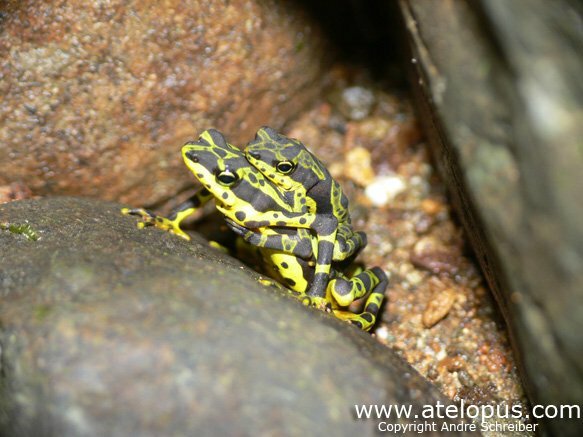 This species is common at a number of localities and has apparently not shown any dramatic population declines. 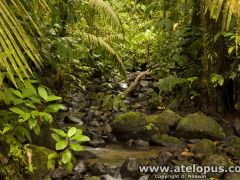 However it is vulnerable for the major threats as deforestation for agricultural development, the planting of illegal crops, logging, and human settlement, and pollution resulting from the spraying of illegal crops. 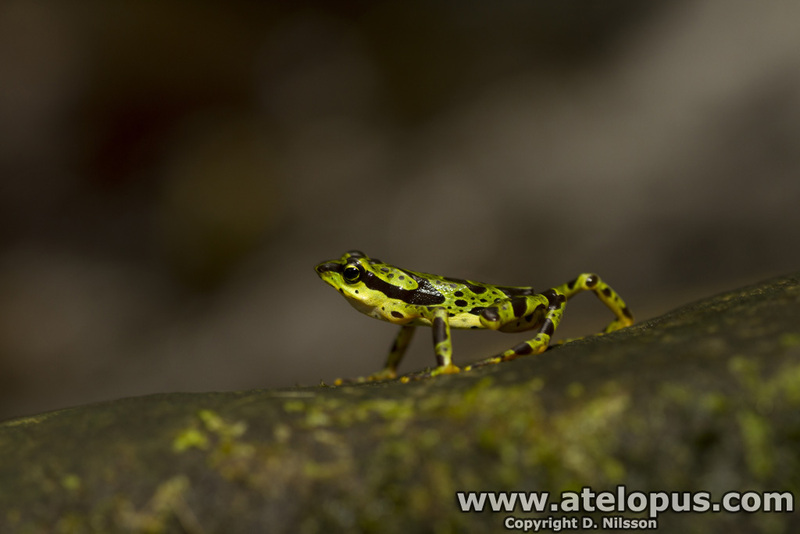 Since it occurs at very low altitudes and at relatively high temperatures, it might not be as prone to chytridiomycosis as other members of its genus. 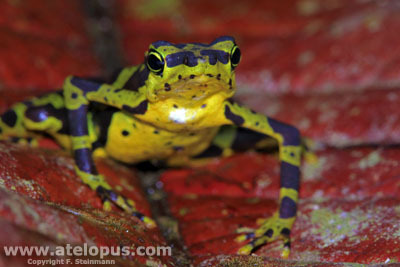 Large populations was observed in Bahia Solano and El Valle area in Choco in March 2011 (D. Nilsson), January 2012 (A. Reiss), October 2009 (F. Steinmann). 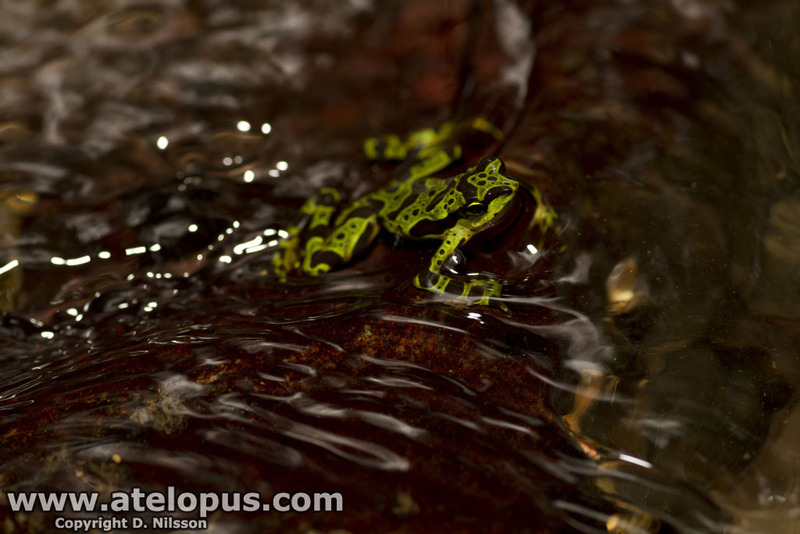 Atelopus spurrelli where commonly found around the streams. 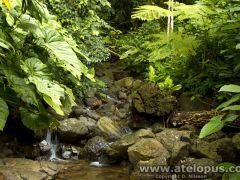 The threat in this particular area could be heavy deforestation which is taking place in the area. 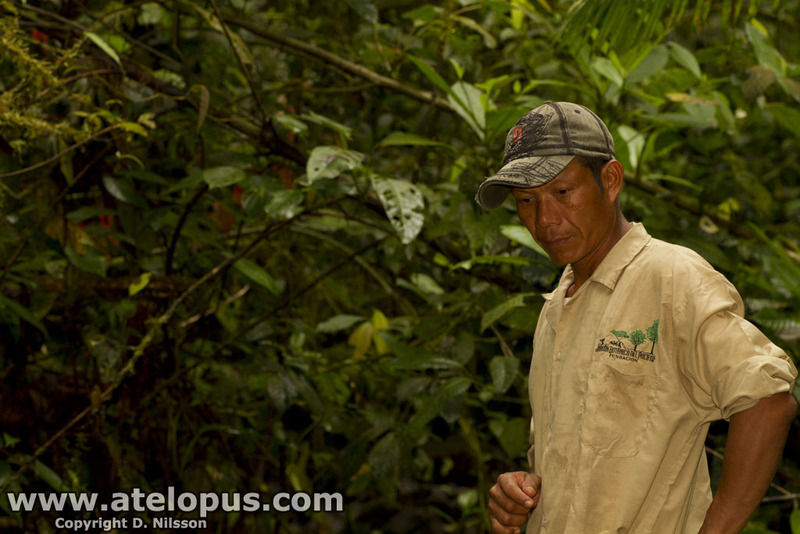 Canadian wood companies are behind this, flies out huge amounts of timber with helicopter. 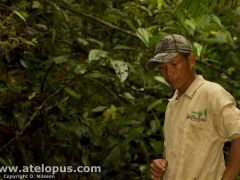 Anthonyo guiding us in one of the protected areas in Bahia Solano. 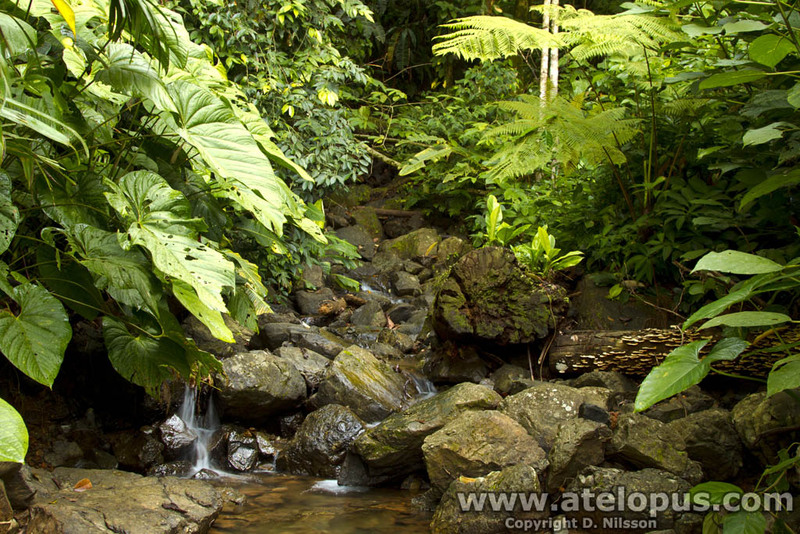 This is a terrestrial species inhabiting tropical lowland forest. 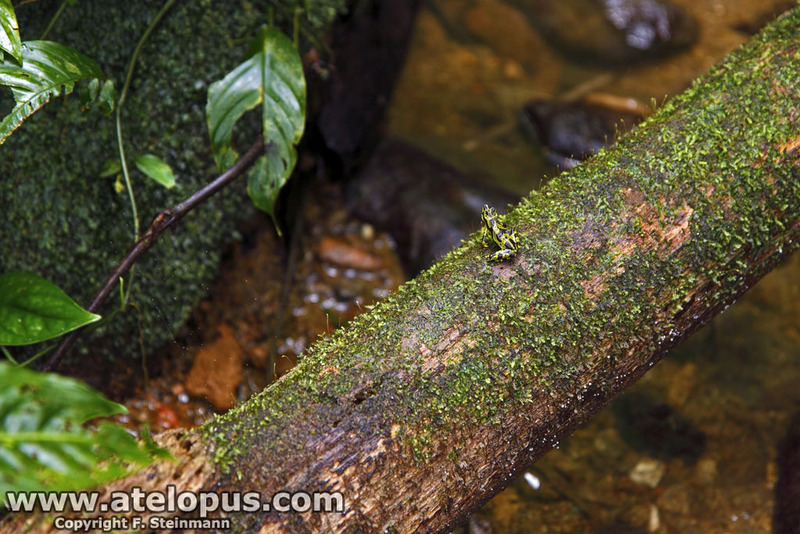 Breeding and larval development is presumed to take place in forest streams. 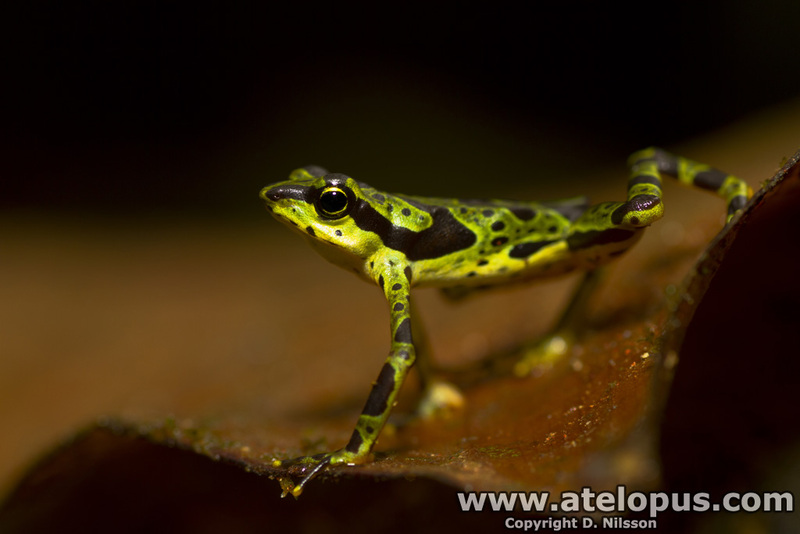 It has been found both in primary and secondary forest but not in heavily degraded areas. 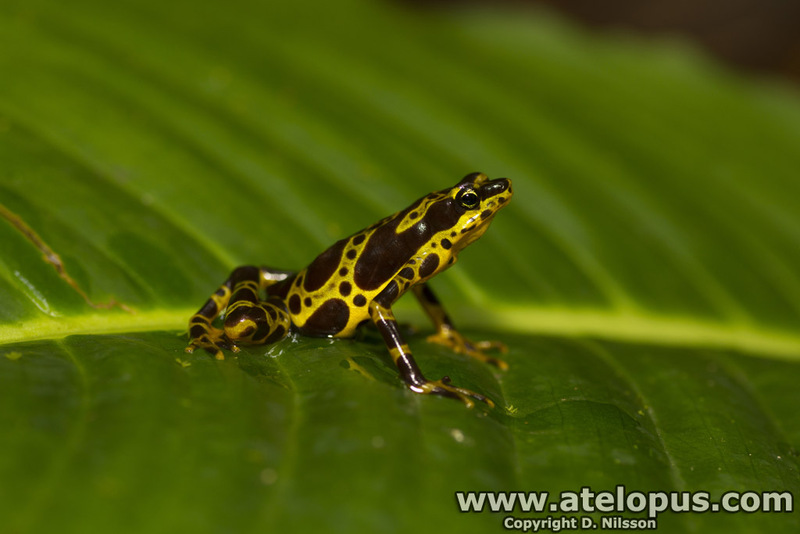 Atelopus spurrelli habitat in the Bahia Solano area. 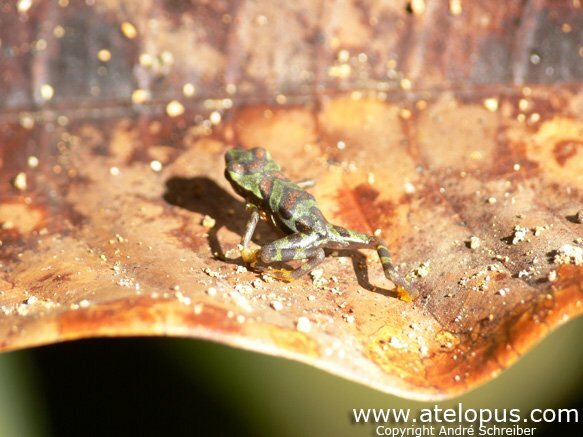 Atelopus spurrelli habitat in the El Valle area. 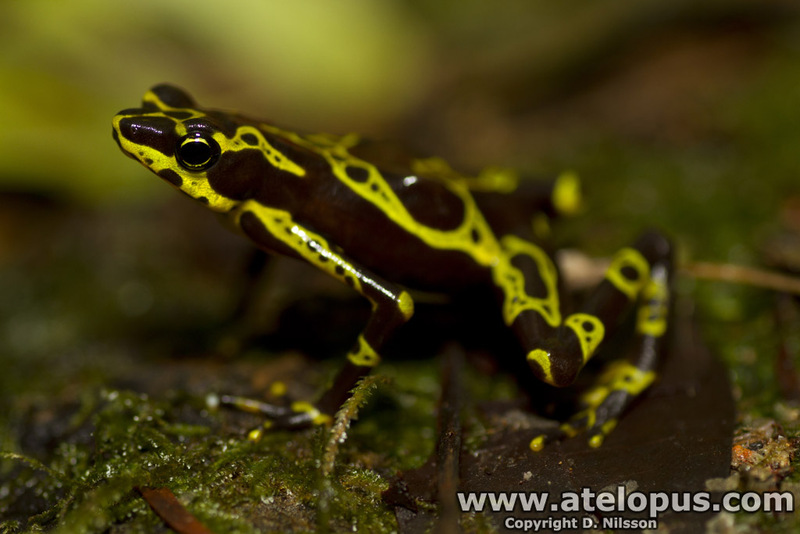 Atelopus spurrelli is normally having a green or yellow color with black spots on a black base on dorsal. It seems like the color can vary within the same population between green and more yellow. 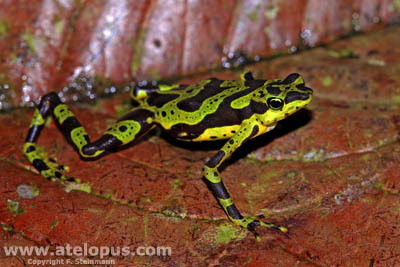 Ventral is normally yellow with black spots. 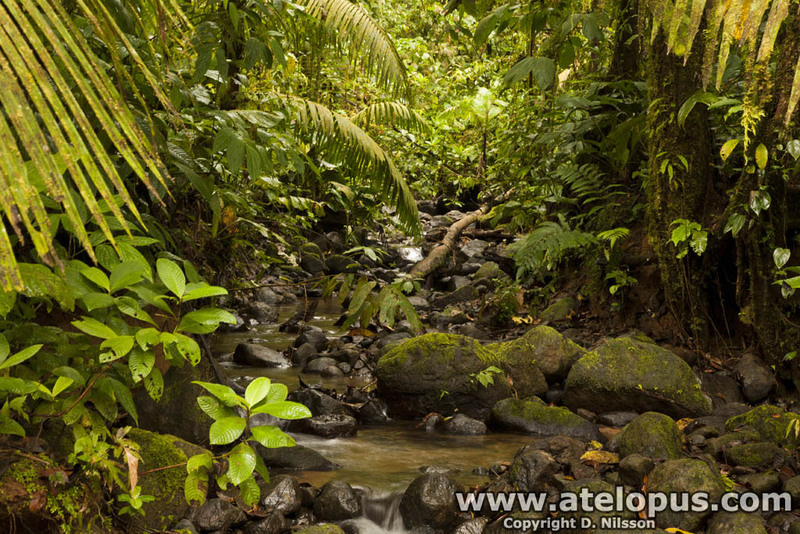 The palms and soles are orange. 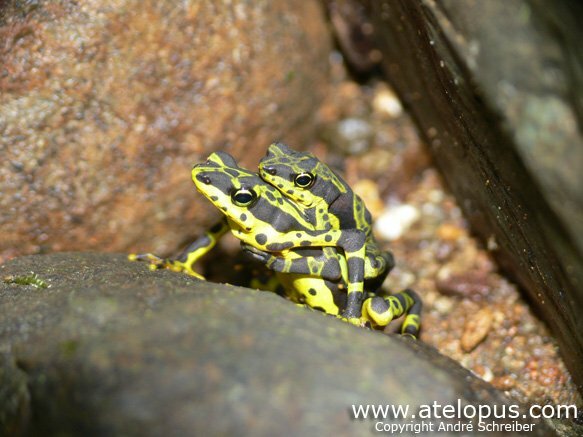 Atelopus spurrelli occurs in several protected areas but continued monitoring is needed. 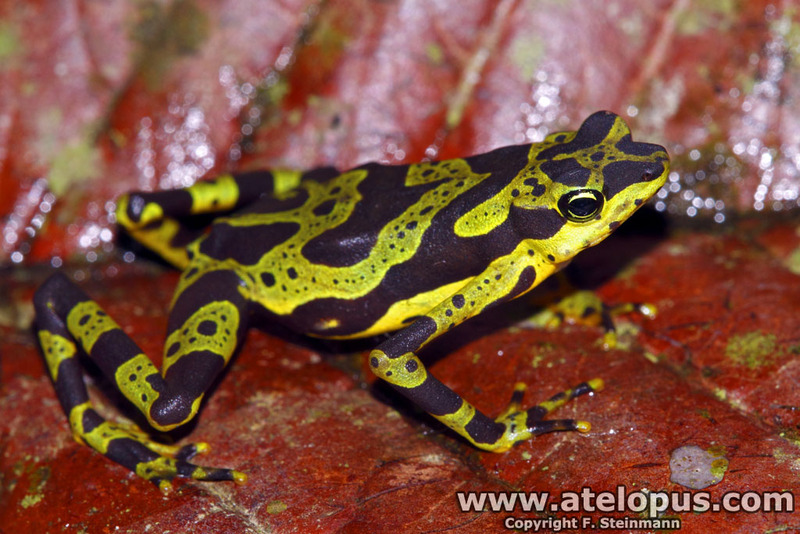 Especially due to the potential threat of chytridiomycosis, but also due to the deforestation in some areas. 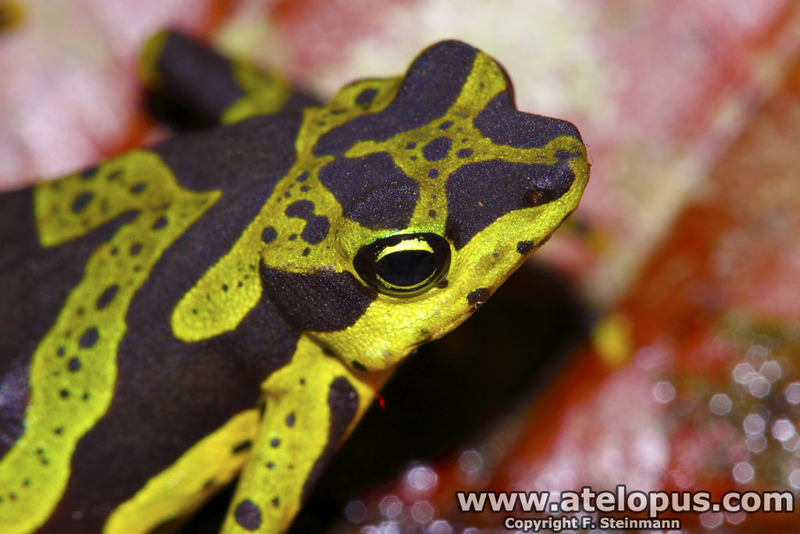 Roberto Ibanez, Cesar A. Jaramillo & Frank A Solis (1995) - A new species of Atelopus from Panama. PDF available.